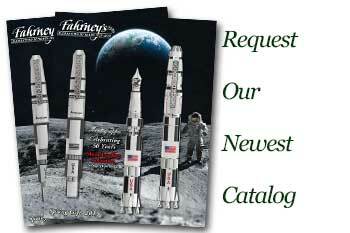 Order your Fahrney's Exclusive Retro 51 Acid Etched Signatures III Fountain Pen today from FahrneysPens.com. Fine Pens, Refills & Luxurious Gifts – great prices & fast shipping. Fahrney's Pens and Retro 51 are proud to present the new 2017 special edition 'Signatures III' collection featuring the most famous of all American signatures - those found on the Declaration of Independence. Retro 51 created this beautiful collection with the esteemed document's signatures acid etched on the brass-plate solid metal barrel and cap. The Retro Tornado-style pens are enhanced with brushed antiqued gunmetal clips and trim. The cap band is engraved with Fahrney's logo; the Declaration's date, 'July 4, 1776,' is stamped on the crown. The 'Signatures III' collection includes an EXT fountain pen with steel nib, a twist-top rollerball, 1.15mm pencil with black eraser and a matching spiral notebook with the Declaration of Independence printed on the cover. Each pen is packaged in a custom-designed tube. Cartridge/converter fill. I got this pen to impress my students, and it impressed me too. I love the weight and feel, it's very comfortable to write with, reliable, and a very nice nib. I use it all the time. Looks great inked with Diamine Ancient Copper! I'm glad I pulled the trigger and got this little gem. I'm a big "1776" fan. Always looking for a "Series II from 2016!" (what does the Series I even look like?) I like the weight the etched signatures and all the detail work are well done - well done ... would like to see the grip section made of something other than plastic - it would be well worth the up-tick in price!